This state-of-the-art induction hob has intelligent sensor technology to save you money and make your kitchen a safer place. Induction hobs work by heating the base of the pan, rather than the entire cooking zone. A magnetic field induces the heat directly for more efficient cooking. The T40B31X2GB has four cooking zones – two 1.4kW zones at the back and two 1.8kW zones at the front. This range of power levels means you can choose a lower power to gently make a sauce or a higher wattage to rapidly boil a large pot. The automatic pan recognition system can sense whether or not the zone is being used. Induction heat works with ferrous metal pans and will only work if one is on the hob. This is safer and more energy efficient than a ceramic hob. No heat will be transmitted when you’re not using it, even if a metal spoon is accidentally left on the cooking surface. This model has electronic touch controls with a clear LED display for each zone. Never overcook a soft boiled egg again with the built-in LED timers, which have a switch off function and acoustic signal. A handy Quickstart option allows instant cooking for those tea times when you’re in a hurry. Hob controls are often found on the right hand side, which can be awkward for left handed people to use. With the T40B31X2GB they are set at the front of the hob so they can be used safely and easily by anyone. 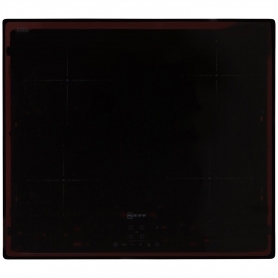 While induction hobs don’t heat the surface directly, they can still get warm from residual heat emitted from the pan bases. With this model the hob surface will remain lit until it’s cool enough to touch. There’s also a childproof lock for added peace of mind. 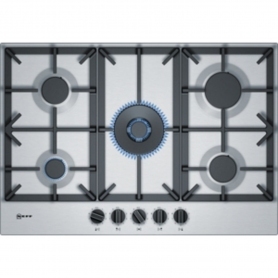 This Neff hob adds contemporary touch to any kitchen. It’s made from sleek black glass and is completely frameless so you can enjoy a really integrated look. At nearly 60cm wide, it can fit above a built-in oven or below an extractor fan with ease. The 110 cm cable and 13 amp 3 point plug means it can be installed almost anywhere. Update your kitchen with the stylish, efficient and easy-to-use T40B31X2GB. Buy yours here.